These are the place to consider if you are looking for a place to stay within the Sydney Central Business District. Ultimo, Chippendale, Surry Hills, Haymarket, Pyrmont, Barangaroo, Woolloomooloo, Darlinghurst and maybe Glebe and Potts Point. George Street in Sydney is considered to be the High Street and the busiest street in Sydney. 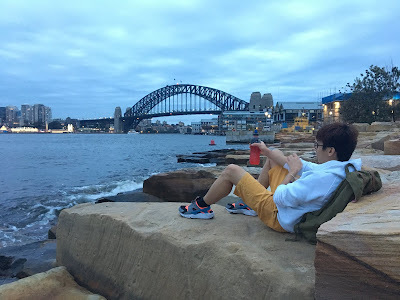 It is about 3km long starting from "The Rocks" Circular Quey where the popular Opera House and Harbour Bridge is located and end at the Chippendale and Ultimo where the Sydney Central Station, Railway Square, and Central Park Mall is located. Going through the street will connect to Broadway and then Parramatta Road where the University of Sydney is located. Chippendale is a small inner Sydney suburb where you will see the Mercure Hotel, UTS (University of Technology Sydney) just when you get out of the Sydney Central Station Grand Concourse. I used to stay in one of the apartment just behind the Mercure Hotel during my first few months in Sydney. KFC, Mc Donald, shops and other fast-food here are open until late. Surry Hills is located just on the other side of Sydney Central Station all the way to Oxford Street of Darlinghurst. Most of the houses and establishment here are old looking. I used to stay in one of the apartments here and is good because everything is easily accessible. Darlinghurst is where the Oxford street is located, Oxford street is the home of bars and restaurants mostly related to LGBT community but is open for everybody. Houses and apartment here are both old and modern. The other side of Darlinghurst is the popular Hyde Park where the Museum Train Station is located. Woolloomooloo is another inner suburbs of Sydney, The first thing you will notice in the location is the Woolloomooloo Bay with high-end restaurants and big parks known as "The Domain" The Domain is walking distance to Sydney Botanical Garden, St Mary's Church, and on the other side is the suburbs of Potts Point. Potts Point is located next to Woolloomooloo and is around three km from Sydney CBD. The red light district of Sydney is located in the area known as Kings Cross. Kings Cross Station is the nearest Train Station. I used to work in one of the restaurants in Potts Point while living in Surry Hills. Every day I walk around 20 minutes to get to work and 20 minutes coming back home, by bus is just around 10 minutes. Ultimo is the home of the University of Technology Sydney, TAFE Sydney and is actually walking distance to Haymarket Chinatown Paddy's Market or Market City. Haymarket is the home of Sydney's Chinatown. Shops and restaurants are all over the place, colleges, and university are walking distance. Residents mostly live in a highrise apartment. Very Near to Sydney Central Station. The Tram from Sydney Central Station goes through here to Pyrmont. Pyrmont is the home of Sydney's Fish Market, The Star Casino, Darling Harbour, and Cockle Bay that is adjacent to Sydney City Centre. Madama Tussaud, Sea Life, Museum and other attractions are also located within the Darling Harbor. Walking from the banks of cockle bay you're going to reach the Barangaroo, you will see the modern restaurant in the modern highrise buildings, offices, and commercial buildings. Moving on you will reach the beautiful Barangaroo Reserve/Park and the hill called Millers Point with the view of the big and beautiful Parramatta River/and Harbor Bridge. Walse bay is the next stop where museum and theatres are situated all the way to The Rocks and Circular Quey. If you Cross the Sydney Harbour Bridge you will reach the Milsons Point, Luna Park, Kirribilli and the rest of North Sydney. Places like Bondi Beach, Coogee Beach, Watson Bay, Manly, Parramatta, Chatswood, Cronulla, Blue Mountain, even Newcastle, Wollongong can be reach easy by public transportation such as Trains, Buses, and Ferries. Thank you po. Sana po ma pansin nyo po comment ko po. Actually study po ako sa AU, sydney prob po for now yung place ko pag stay salamat sa mga website po.